NBA all-stars LeBron James, Kobe Bryant and Kevin Durant received special shoes from Nike commemorating Houston's tie to space exploration. Houston, you've got a space shoe. Nike has introduced a new set of colors and designs for its line of basketball sneakers sparked by the Texas city's space lineage. Specifically, the Christopher C. Kraft, Jr. Mission Control Center at NASA's Johnson Space Center — widely known by its radio call sign "Houston" — provided the sportswear company with the "creative inspiration" for a collection of shoes for NBA all-stars LeBron James, Kobe Bryant and Kevin Durant. Houston received the official nickname of "Space City" in 1967 because it is the heart of NASA's manned spaceflight program. The Johnson Space Center, which marked its 50th anniversary in 2011, has led crewed missions to the moon and International Space Station, and is home to the United States' astronaut corps. LEBRON X – "Originating from fictional Nike Space Program (NSP) planet NSP-LJ6, LeBron James' dominance was born from the volcanic surface in the planet's mantle," describes Nike. "He's rumored to have journeyed to earth on a meteor made of the galaxy's hardest substance — black diamonds." KOBE 8 SYSTEM – "With origins rooted on a planet marked as NSP-KB24, the Ice Mamba circles the volatile surface as guardian of the five rings. The wise veteran is known to strike with moves that leave his opponents frozen." KD V – "Identified as Dark Matter, the biological and molecular breakdown of this figure [Durant] remains a puzzle for scientists. Early readings of its origin, NSP-KD35, have sent back conflicting reports of a planet that is simultaneously solid, liquid, and gas — properties that make his game adaptable to any situation." "It was an intricate, creative and fun project intended to celebrate the game's best," Nike wrote about the brightly colored shoes' design. The space concept was also incorporated into select Nike Basketball apparel including the Nike Hyper Elite Galaxy shorts and a collection of three t-shirts for James, Bryant and Durant. The three Nike Basketball shoes specially engineered for Houston — KOBE 8 SYSTEM, KD V and LEBRON X — went on sale Friday (Feb. 15) at select retail stores and online at Nike.com. The sneakers' introduction was timed to coincide with the 2013 NBA All-Star Game, which was played Sunday (Feb. 17) in Houston's Toyota Center. The new Houston basketball collection is not the first time Nike has looked toward space explorationfor inspiration. 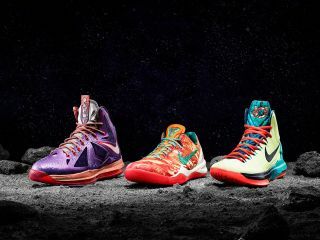 Last February, the company introduced a "galactic theme" based on astronauts' spacesuits for James, Bryant and Durant. And in January 2010, Nike partnered with Apollo 11 moonwalker Buzz Aldrin to introduce the Rocket Hero Mavrk Mid 2 featuring an upper design based on photos taken by the astronaut while he was on the moon.